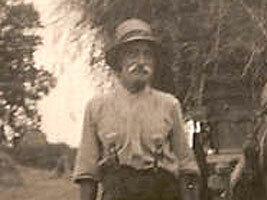 This is believed to be a photo of William Moss who was born about 1879 in Monewden, Suffolk. William was the son of Benjamin Moss and Mary Stocking and married Alice Peck. He was a horseman on a farm. 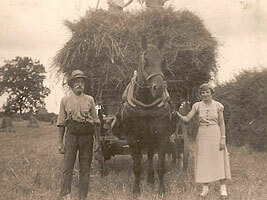 The writing on the back of the photo says 'to Mr Moss from Olive' . He is our 2nd cousin twice removed. Photo courtesy of Lisa Moss. Douglas Moss. We have this photo of Douglas, but we don't know who his parents are, can anybody help? Another Mystery photo. 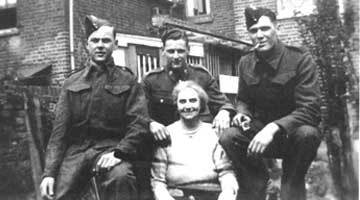 This is marked "Aunt Toll" we think it is a Moss family photo - it looks like Douglas again in the middle of the three men. If anybody knows who this is we would love to hear from you. 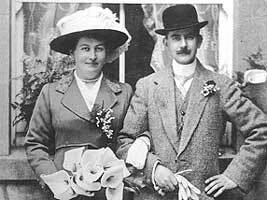 William Moss born abt 1881 in Shrewsbury with his 2nd wife Charlotte (Lottie) on their wedding day. William is the son of Robert Moss & Mary Partridge. 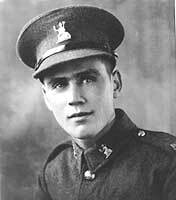 William is our Great Uncle.